Featuring one-gallon solution and recovery tank, two squeegees for pick-up in forward and reverse, and a low profile. Featuring two counter-rotating brushes with variable cleaning pressure and two squeegees for pick-up in forward and reverse. Featuring: The ability to customize with your choice of roller brush or traditional disc brush head, large 10.6 gallon tank capacity provides long working time, 33.5-inch squeegee width, easy-to-use control panel with ability to program three custom cleaning programs to fit various surfaces or soil levels, tool-free deck head changing allows easy conversion from 17” scrubber to 22” in minutes, tank-in-tank system provides complete access to clean and recovery water tanks, maintenance friendly, suitable for stripping floors. Diverse. Efficient. Quite. Fully configurable walk-behind scrubber. Efficient cleaning has a new name: The B 60 W Bp. Not only is this machine economical, it also performs well in on large surface areas. 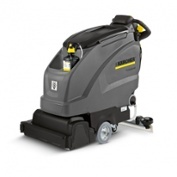 Kärcher’s B 80 W BP battery-operated, walk behind scrubber is the most versatile, full-featured scrubber on the market. Customizable with either cylindrical roller brushes or disc pads, the B 80 W Bp provides cleaning paths of either 22, 26 or 30 inches while our Tank-in-Tank system that gives the operator full access to the water recovery tank making the unit suitable for stripping floors and maintenance friendly, suitable for stripping floors. Featuring large capacity water and waste tanks, EASY™ controls as well as tool-free brush removal, the B 90 R is the ideal ride-on scrubber.